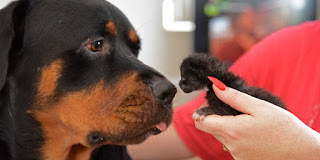 Rottweiler adopts kittens that were left to die in the street ! A Rottweiler dog adopted three abandoned kittens that were left to die in the street. The trio were found dumped in the streets in New Zealand last week and taken to the vets, asking for someone to take them on. Chelles McIntosh responded to the call for help and found her dog Bear was fascinated with the tiny bundles of fur. The rottweiler liked to lick two-week-old Inky, Pinky and Ponky clean every time they had finished a feed of milk formula. "He just has such a kind, loving nature about him." the dog owner said. "He comes and finds me when they are crying. It's just him being a typical Rottweiler that hasn't been raised to be aggressive ... and would be a wonderful mother except he doesn't have the right bits." she said.